A rare, stolen photo of Al Reach is wanted by the FBI in conjunction with their investigation into thefts at the NYPL. Now, thanks to unsolved crimes, including thefts at the New York Public Library in the 1970s, Reach is wanted by the FBI, not the Hall of Fame. A rare cabinet photo of Reach, that is. In 1921, a cabinet photo of Reach was donated to the New York Public Library by the widow of Hall of Famer Albert Spalding. The photo was part of a huge archive owned by Spalding and now constitutes the library’s great “A.G Spalding Baseball Collection” housed at the main branch on 5th Avenue in New York City. In 1987, the library did an inventory of the Spalding Collection’s photographic holdings and it was discovered that many of the photos in the collection were missing, including a cabinet photo of Reach taken by the photographer C. M. Gilbert of Philadelphia. The library compiled a “Missing List” and that list included the entry, “Reach, Al. (C.M. Gilbert).” The entry was based on the original 1922 inventory of the collection published in the New York Public Library Bulletin. In 1911 A. G. Spalding used this same photograph in his book, America’s National Game. In 1992, a photograph fitting this description was sold at auction in San Francisco by Richard Wolfers Auctions as: “A. J. Reach Autographed Cabinet Card….turn of the century Gilbert Cabinet Card and scarce portrait of one of baseball’s true pioneers.” The auction estimate was $5,000-$6,000. 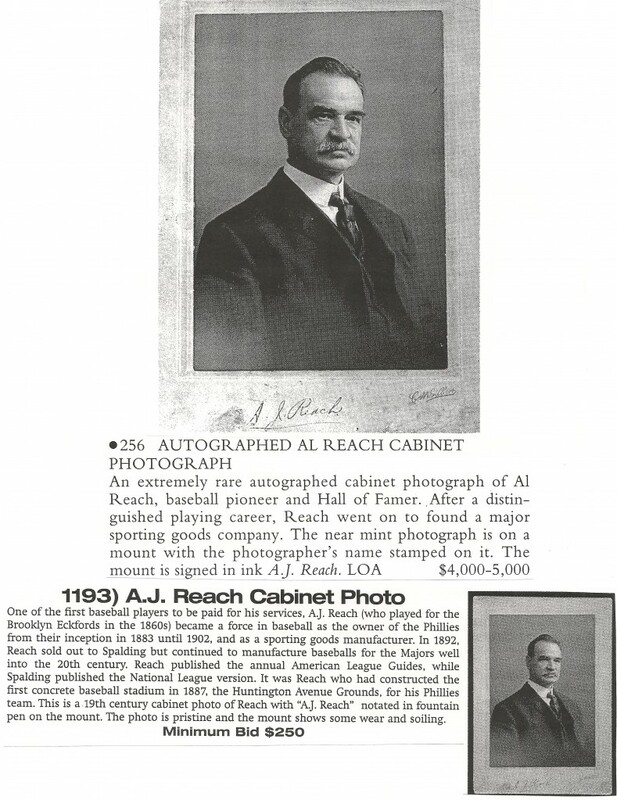 The NYPL's missing Reach cabinet photo appears to have been sold as Lot 132 in Wolfers' 1992 Treasures of the Game auction. Luckily, the NYPL made their collection available to baseball publications like The Sporting News, who ordered a “photostat negative” of the original Reach photo at the library before it was stolen in the 1970s. Recently the John Rogers Archive purchased the entire photographic files from the Sporting News and have been selling the original prints with several well-known baseball auctioneers. In the current MEARS auction, lot 552 is the actual “photostat negative” ordered by TSN for publication. The negative shows many of the imperfections visible on the original and appears to be the exact same photograph as the example offered at Wolfers Auctions in 1992. The most telling sign is a distinctive blemish or mark on both the photograph and the negative, to the right of Reach’s head. 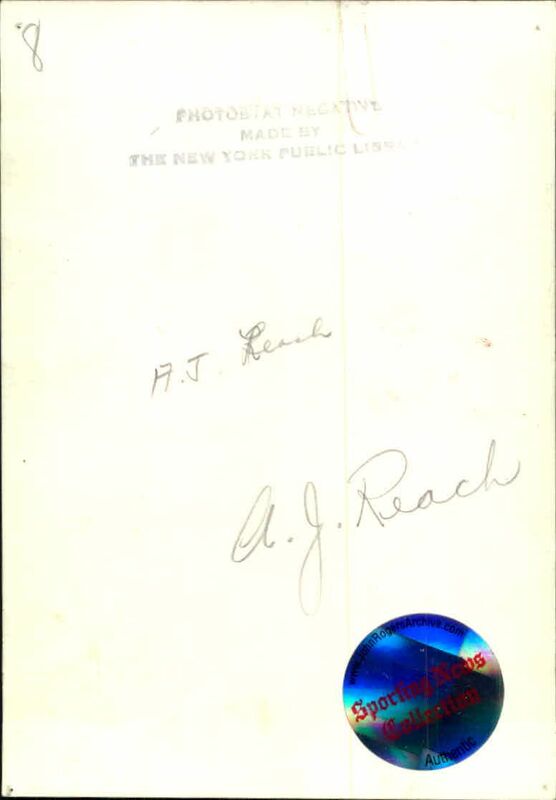 This TSN "photostat negative" of the original NYPL photo of Reach appears in the current MEARS online auction. The negative exhibits the same imperfections as the Reach photo sold at Wolfers Auction in 1992. 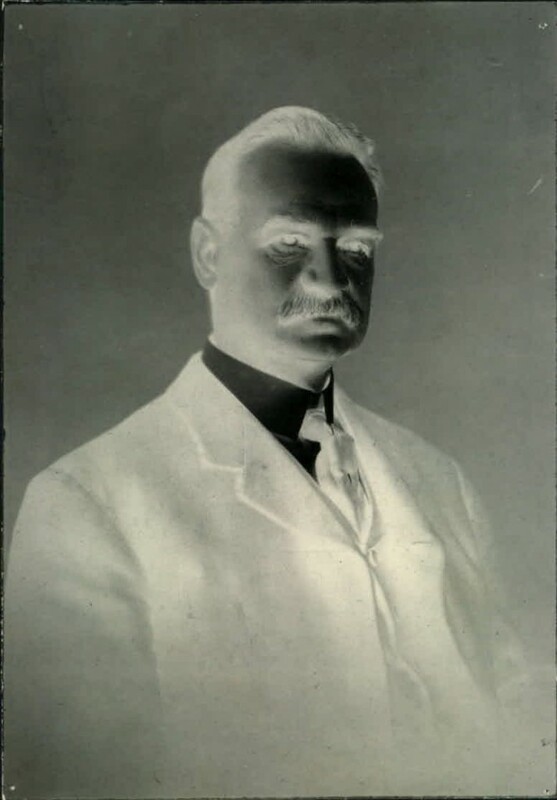 The reverse of the TSN photo reveals that it was ordered directly from the New York Public Library years before the original cabinet photo of Al Reach went missing. The Gilbert photograph of Al Reach that was originally sold at Wolfers in 1992 has also appeared in subsequent auctions at Christies (as Lot 256) in 1994 and in a Mastro Fine Sports sale of 1999 (as Lot 1193). The Reach cabinet also appears on the Hauls of Shame, “Halper Hot 100 List” as number 56: http://haulsofshame.com/blog/?p=1465 The reverse of this cabinet card most likely exhibits surface paper loss or alterations that conceal the NYPL ownership stamps and markings. 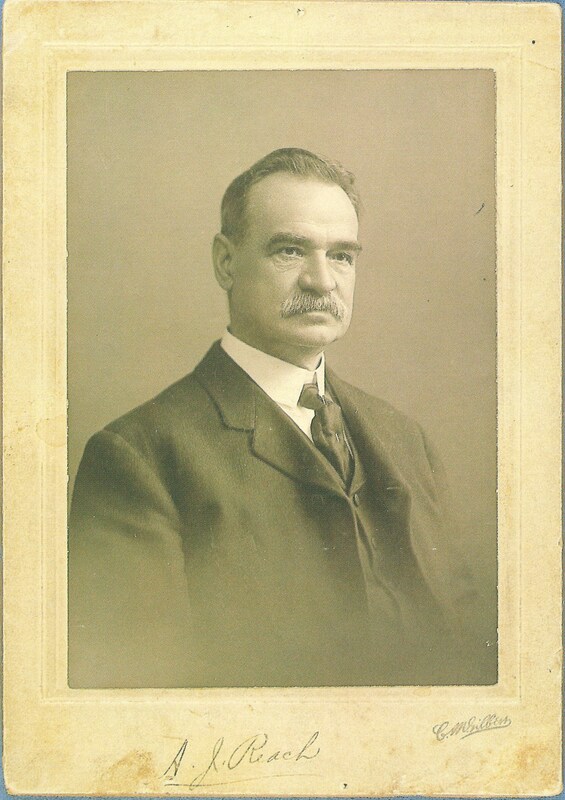 It is the only Gilbert portrait of Reach ever offered at a public sale and is believed to be the only known surviving example of this cabinet card. (Top) The missing Reach cabinet as it appeared for sale at Christies Auction house in 1994. (Bottom) The Reach cabinet as it appeared for sale at Mastro Fine Sports in 1999. WOW. Great work yet again! Nice work. Now,can you track down that missing copy of Tropic of Cancer? Or was that Tropic of Capricorn, Joy-Boy??? Another Hobby WikiLeak brought to you by HOS! Can one obtain, or can you publish, a list of the stolen items from the New York Public library per your comment about compiling the list? EG The “Missing Items” you reference from 1987 and/or an updated list? I remember exactly what I was wearing and what type of gum I was chewing when I last saw this photo at the NYPL.I remember the joy-boys and their good-time friends drew wee-wees and pee-pees on it. Has anyone considered looking in the infamous Halper Collection of stolen items for this, as the dates are in his time frame.??????????? ?